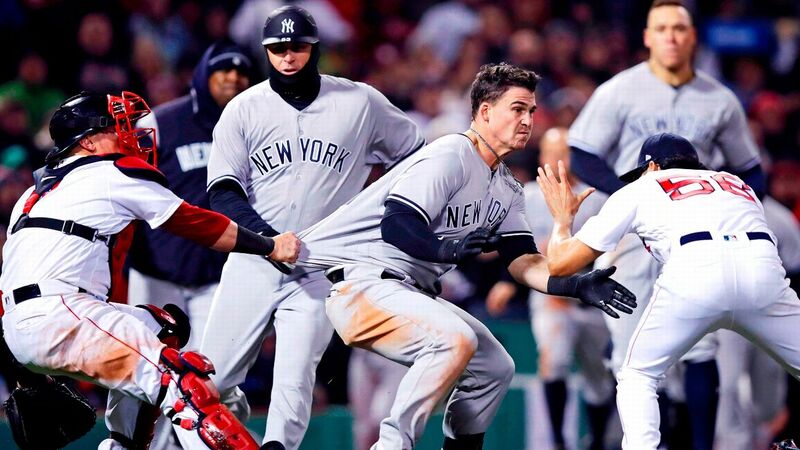 NEW YORK -- When Tyler Austin tangled with Joe Kellylast month, we saw once again just how intense this time-testedNew York Yankees-Boston Red Sox feud can be. Still, Austin said he isn't anticipating this week's three-game set between his Yankees and Kelly's Red Sox to be different from any other series he'll play in this season. Boston is just another team on the schedule to him. "We're just coming out here to try to win ballgames," Austin said when asked about the rivalry returning to Yankee Stadium. After making that dry statement and several others like it, Austin burst out laughing. He knew exactly what he was doing. He wasn't falling for any traps that might stir up more drama. "I'm pretty boring over here, guys," he said, still laughing. Yeah, sure he's boring. And sure these next three games will be boring too. Indeed, it's natural to be excited for this series, and here's why: Both teams are very good and very entertaining this year, coming in with the two best records in baseball. The Red Sox broke out to a 17-2 start, and the Yankees have responded by winning 15 of their past 16. The Sox enter the series with a one-game lead in the American League East. Yes, it's only May, but given the short- and long-term history between these teams, the adrenaline should be pumping on both sides. Here's a game-by-game look at the showdown in the Bronx. The hero:Giancarlo Stanton powered the Yankees with two home runs and Aaron Judge hit a tiebreaking single to carry New York to a series-opening victory. The impact:The win gave the Yankees 16 victories in their last 17 games and pushed their current winning streak to seven. The loss dropped the Red Sox out of sole possession of first place in the AL East, as Boston and New York now own identical 25-10 records. The quote of the night:"It's a lot of fun to play in these games, I'm not going to lie." -- Yankees manager Aaron Boone. The stat to know:Stanton has hit seven home runs this season in eight games started by Luis Severino and two home runs in 27 games started by anyone else on the Yankees. The hero:Brett Gardner's two-run go-ahead triple off Red Sox closer Craig Kimbrel -- followed by Judge's two-run blast into Monument Park -- keyed the Yankees' eighth-inning rally. The impact: For at least one night, sole possession of first place for the Bronx Bombers. The quote of the night: "It's May, and it's bedlam." -- Boone. The stat to know:Since the Yankees' 17-1 stretch began on April 21, they have a .331/.430/.636 slash line in the eighth inning or later. When Rick Porcello was still Boston's scheduled starter, this series finale arguably would have been the premier matchup of the week, featuring a pair of former Cy Young Award winners who have both shown Cy Young form recently. But with Porcello pitching Wednesday, the Red Sox are going with the 25-year-old lefty Rodriguez, who has struggled to keep runs off the scoreboard this season. He has allowed 19 earned runs in 32 innings. Rodriguez also has given up six home runs, averaging one per start. In this late stage of Sabathia's career, the 37-year-old has figured out how to control the strike zone despite his lost velocity. Sabathia's past four outings have been particularly impressive. Across 23 innings, the left-hander has allowed just one earned run. Following an early April disabled list stint for a hip injury, he has helped the Yankees beat the Blue Jays, Twins, Angels and Indians, teams that could factor into the postseason race as the season goes on. As his team prepared for the series, Yankees manager Aaron Boone had a simple message for his hitters regarding the Red Sox's starting pitchers: "Go make them earn it." "I feel confident our guys will come out and do that. We understand all that goes with [the series] from the outside, that there will be more eyes on this one," Boone said, "and that's what you love about being a part of this." Giancarlo Stanton improves his season home run total to 9 with a pair against the Red Sox to power the Yankees to a 3-2 victory.